Our History | Tucson Realty & Trust Co. Management Services, L.L.C. 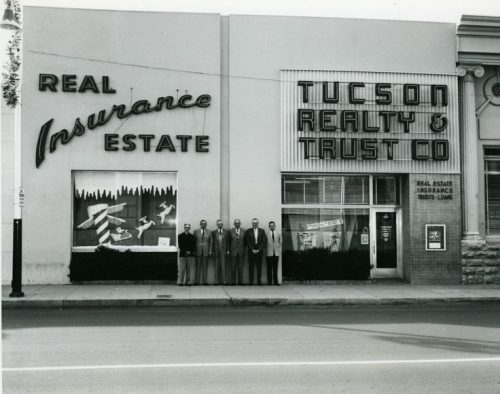 Tucson Realty & Trust Co . was incorporated under the laws of the Territory of Arizona on December 22, 1911 and adopted the bulls-eye as its logo. That same year, George H. Amos came to work for the firm, sweeping the office, cleaning the spittoons and sprucing up rental homes. Soon after, he became a rent collector and eventually the leading insurance agent in the community, all before his 20th birthday. It is believed that Amos sold the first automobile insurance policy in Arizona in 1915. In 1924 he was elected a vice president and director of Tucson Realty & Trust Co., eventually to be named president of the firm. When George H. Amos died in 1976, after 65 years of dedicated service, his son George H. Amos Jr., known as “Buddy”, assumed the presidency of Tucson Realty & Trust Co. Buddy, an insurance agent and community philanthropist, was well known for his work with the Arizona’s Children’s Home and St. Joseph’s Hospital. The company has seen many changes over the years. We no longer sell insurance or offer trust and residential brokerage services, but continue to provide full-service commercial and management real estate services. Tucson Realty & Trust Co. Management Services, LLC is proud to be in our eleventh decade of business in Southern Arizona. Come see why no one knows Tucson like Tucson Realty & Trust Co.